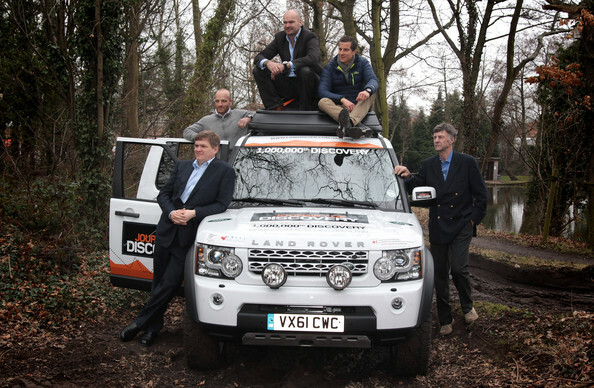 Explorers Ray Mears (L), Ben Saunders (2nd L), Monty Halls (3rd L), Bear Grylls (2nd R) and Sir Ranulph Fiennes (R) pose for a photograph beside the 1,000,000th Land Rover Discovery in the off road track at the Jaguar Land Rover factory on February 29, 2012 in Solihull, England. To mark the production of the millionth Discovery Land Rover is sending the history-making vehicle on a charity expedition to China. The drive from Birmingham to Beijing and billed as Land Rover's most ambitious fund-raising project ever, aims to raise GBP 1million for the International Federation of Red Cross and Red Crescent Societies.